Ginkgo biloba is a unique tree species. Its leaf extract contains a diverse variety of molecules useful in cosmetics and pharmacology. Firstly, they are potent antioxidants, and can even activate the production of enzymes that neutralize free radicals. Combined with the anti-inflammatory effects, this extract provides an effective defense against UV radiation and ageing symptoms. Dermal applications of this extract can even lead to protection of other organs. Another major application of Ginkgo biloba is moisturizing the skin, which helps to increase its elasticity and visual appearance, even reducing the amount of wrinkles. Furthermore, this extract helps to maintain the barrier function of the skin – it reduces water loss through epidermis, thus reducing skin dryness and irritation. In combination with green tea extract, Ginkgo shows even stronger benefits in these areas. NOTE: To assist you with solubility issues, we now also sell Ginkgo Biloba extract as a standardized pre-dissolved solution. Just add the liquid to your cream and mix well. Ginkgo biloba is a unique tree with no close living relatives. An extract produced from its leaves has a large variety of molecules, but most health benefits are associated with two groups – terpene trilactones and flavonoid glycosides. These molecules are potent antioxidants and have numerous other effects: they improve blood flow, protect against capillary fragility, function as anti-inflammatory agents, reduce edema caused by tissue injury, and neutralize free radicals . The same two groups of molecules, together with another one called biflavones, have most promising uses in cosmetics, ranging from simple effects in moisturizing to radiation protection and anti-ageing activity . Skin dryness and irritation can be prevented by helping the skin maintain its barrier function. This is one of the main application of Ginkgo in cosmetics. Even a single application of 1.5%-Ginkgo extract containing cream was enough to improve the barrier properties for 8 hours . Moisturizing and hydrating effects were also observed, together with reduced number and width of wrinkles. Furthermore, longer application of the cream led to thicker epidermis, reducing water loss and additionally helping the barrier function of the skin . Epidermal thickening, higher elasticity and improved skin relief were also observed in another study, proving that the hydrating effect of Ginkgo extract extends to the deeper layers of the skin . Compared to several other extracts investigated, Ginkgo has the strongest effect in moisturizing the skin. Using a cream containing 0.3 % of this extract for 1 month showed various benefits for the skin of volunteers, among them an increase in skin smoothness and reduction of wrinkles . Skin as a barrier is also easily damaged by UV radiation, causing increased water loss and erythema. A cream containing 6 % Ginkgo biloba extract was able to completely negate this damage in mice; it also significantly reduced the number of damaged cells . It is suggested that this result stems from strong antioxidant properties of Ginkgo biloba flavonoids – these molecules protect the skin from free radicals formed under UV , . Additionally, this extract can counter the effects of UV radiation by increasing the levels of enzymes that neutralize free radicals . Surprisingly, this effect is not limited to skin, as dermal application of Ginkgo extract in mice resulted in increased liver, heart and kidney protection . Another study found that this extract can reduce UV damage on the biochemical level (interferes with inflammatory signals), improve the physiological parameters of the skin, and even reduce the amount of course wrinkles . This antioxidant effect of Ginkgo biloba extends even to cancer prevention. Ginkgo extract can achieve this by neutralizing free radicals, helping to repair damaged DNA, and even promoting cancer cells to undergo apoptosis (cell “suicide”), while leaving healthy cells undamaged . It is even suggested as a protective measure for patients undergoing procedures that involve UV exposure, or to prevent the development of radiation-induced dermatitis , . 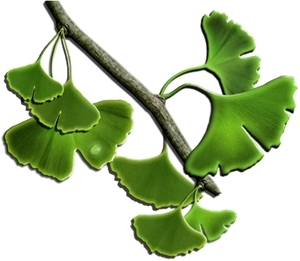 Ginkgetin, one of the biflavone compounds found in Ginkgo biloba, has additional health benefits. It effectively reduced skin inflammation in animal models after just several days of usage . Similar results were found in experiments with human skin cells . Furthermore, Ginkgo biloba extract helps regulate blood flow in skin capillaries, which is especially useful during inflammation , . While the dermal use of many beneficial substances is limited by their poor absorption through skin, Ginkgo biloba extract penetrates the epidermis well and is an effective ingredient in cosmetics . It is also resistant to degradation – a cream containing Ginkgo extract was found to be more stable compared to creams with tea and soybean extracts . However, a combination of these compounds (especially Ginkgo and green tea) is advised, as it has greater activity than application of both components separately. Furthermore, each extract treats different aspects of skin damage, therefore underlining the need for combined use , . 11% solution gives 1% Ginkgo Biloba Extract content in final product. 31% solution gives 3% Ginkgo Biloba Extractcontent in final product. 51% solution gives 5% Ginkgo Biloba Extract content in final product. P.-C. Chan, Q. Xia, and P. P. Fu, “Ginkgo Biloba Leave Extract: Biological, Medicinal, and Toxicological Effects,” J. Environ. Sci. Health Part C, vol. 25, no. 3, pp. 211–244, Sep. 2007. P. M. B. G. M. Campos, M. D. Gianeti, D. G. Mercurio, and L. R. Gaspar, “Synergistic effects of green tea and ginkgo biloba extracts on the improvement of skin barrier function and elasticity,” J. Drugs Dermatol. JDD, vol. 13, no. 9, pp. 1092–1097, Sep. 2014. M. D. Gianeti and P. M. B. G. Maia Campos, “Efficacy evaluation of a multifunctional cosmetic formulation: the benefits of a combination of active antioxidant substances,” Mol. Basel Switz., vol. 19, no. 11, pp. 18268–18282, 2014. P. Chuarienthong, N. Lourith, and P. Leelapornpisid, “Clinical efficacy comparison of anti-wrinkle cosmetics containing herbal flavonoids,” Int. J. Cosmet. Sci., vol. 32, no. 2, pp. 99–106, Apr. 2010. S. E. Dal Belo, L. R. Gaspar, and P. M. B. G. Maia Campos, “Photoprotective effects of topical formulations containing a combination of Ginkgo biloba and green tea extracts,” Phytother. Res. PTR, vol. 25, no. 12, pp. 1854–1860, Dec. 2011. J. Hibatallah, C. Carduner, and M. C. Poelman, “In-vivo and in-vitro assessment of the free-radical-scavenger activity of Ginkgo flavone glycosides at high concentration,” J. Pharm. Pharmacol., vol. 51, no. 12, pp. 1435–1440, Dec. 1999. A. Aricioglu, M. Bozkurt, B. Balabanli, M. Kilinç, N. K. Nazaroglu, and N. Türközkan, “Changes in zinc levels and superoxide dismutase activities in the skin of acute, ultraviolet-B-irradiated mice after treatment with ginkgo biloba extract,” Biol. Trace Elem. Res., vol. 80, no. 2, pp. 175–179, May 2001. S. Y. Lin and H. P. Chang, “Induction of superoxide dismutase and catalase activity in different rat tissues and protection from UVB irradiation after topical application of Ginkgo biloba extracts,” Methods Find. Exp. Clin. Pharmacol., vol. 19, no. 6, pp. 367–371, Aug. 1997. C.-C. Chen, A.-N. Chiang, H.-N. Liu, and Y.-T. Chang, “EGb-761 prevents ultraviolet B-induced photoaging via inactivation of mitogen-activated protein kinases and proinflammatory cytokine expression,” J. Dermatol. Sci., vol. 75, no. 1, pp. 55–62, Jul. 2014. R. Eli and J. A. Fasciano, “An adjunctive preventive treatment for cancer: ultraviolet light and ginkgo biloba, together with other antioxidants, are a safe and powerful, but largely ignored, treatment option for the prevention of cancer,” Med. Hypotheses, vol. 66, no. 6, pp. 1152–1156, 2006. E. Yirmibesoglu, E. Karahacioglu, D. Kilic, N. Lortlar, G. Akbulut, and S. Omeroglu, “The protective effects of Ginkgo biloba extract (EGb-761) on radiation-induced dermatitis: an experimental study,” Clin. Exp. Dermatol., vol. 37, no. 4, pp. 387–394, Jun. 2012. H. Lim, K. H. Son, H. W. Chang, S. S. Kang, and H. P. Kim, “Effects of anti-inflammatory biflavonoid, ginkgetin, on chronic skin inflammation,” Biol. Pharm. Bull., vol. 29, no. 5, pp. 1046–1049, May 2006. S. Trompezinski, M. Bonneville, I. Pernet, A. Denis, D. Schmitt, and J. Viac, “Gingko biloba extract reduces VEGF and CXCL-8/IL-8 levels in keratinocytes with cumulative effect with epigallocatechin-3-gallate,” Arch. Dermatol. Res., vol. 302, no. 3, pp. 183–189, Apr. 2010. E. Boelsma, R.-J. A. N. Lamers, H. F. J. Hendriks, J. H. J. van Nesselrooij, and L. Roza, “Evidence of the regulatory effect of Ginkgo biloba extract on skin blood flow and study of its effects on urinary metabolites in healthy humans,” Planta Med., vol. 70, no. 11, pp. 1052–1057, Nov. 2004. S. E. dal Belo, L. R. Gaspar, P. M. B. G. Maia Campos, and J.-P. Marty, “Skin penetration of epigallocatechin-3-gallate and quercetin from green tea and Ginkgo biloba extracts vehiculated in cosmetic formulations,” Skin Pharmacol. Physiol., vol. 22, no. 6, pp. 299–304, 2009.